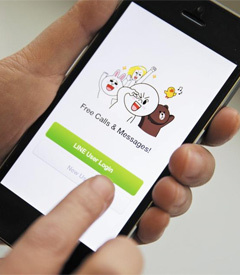 Mobile messaging service Line has reportedly applied to be listed on the Tokyo Stock Exchange. Line is a fully owned subsidiary of Korea's largest portal site Naver. The service had 470 million subscribers around the world as of June this year, some 50 million of them in Japan. In addition to being primarily a messenger app for smartphones, Line serves as a platform for a number of businesses such as mobile games and location-based advertising. Listed, it is estimated to be worth around 1 trillion yen. Line hopes to be listed as early as November, and then expand to the NASDAQ or New York Stock Exchange. According to Business Insider, Line has 230 million monthly active users, making it the third largest in the world after Whatsapp, which was recently acquired by Facebook, and WeChat operated by China's Tencent. Users spend an average of 94 minutes per week on Line, the fourth longest time among mobile messengers. The pressing issue for Line is to tackle its heavy dependence on the Japanese market.